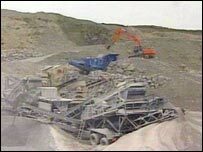 A Cornwall china clay pit is to close as part of a firm's reorganisation in the south west. Imerys confirmed on Friday it is to close Blackpool Pit near Trewoon at the end of next year and said employees were informed on Thursday. Imerys is making 800 redundancies, almost half of the French company's 2,000-strong workforce in the region. A Transport and General Workers Union spokeswoman said: "We knew it would be a sad day whatever pit was closed." Laura Lamprell, of the union, said members were not happy. "Obviously we are going to have lots of members who are going to be shocked and upset yet again at this decision today." Imerys is Cornwall's largest private employer. Workers have said they will fight the redundancies, 700 in Cornwall and 85 in Devon, which are predicted to have a massive impact on the region's economy. Some of the current operations carried out in the county will be moved to Brazil.